My A�relief is palpable. Ita��s well into the middle of the month and the soppy kisses and vigorous bear hugs wishing you a a�?Happy New Yeara�� has thankfully eased a bit. It is possible to have some semblance of a conversation with people without enduring high octave squeals of the said greeting that makes one temporarily deaf. Hallelujah! Order has been thankfully restored to the a�?pretty peoplea�� circuit. I had a glorious week of meeting friends I hadna��t met in quite a while. Good friend, Jamshed Surti, VP, Woodlands Hotels, celebrated his birthday with us over a dinner at the ITC Gardenia. Resident masterchef Greco Vittorio was delighted to see us, (being a discerning diner has its advantages dahlings), and whipped up a dinner that would make the Roman emperors green with envy. Decadent yet avant-garde, the meal was to die for, and spurred on by a fine bottle of Barolo red wine, the evening turned into a raucous night. Still a little blurry eyed with the previous nighta��s festivities, I braved a long standing luncheon date with my a�?gal palsa�� Anuja Sharma and Roshan Kuka at Toscano the next day. The conversation turned from the staid and serious to funny and rambunctious in a blink of an eye, and after that, there was no stopping us. We have a great time catching up with all the local gossip and shenanigans that seem to envelop namma Bengaluru. Though I must admit, I did grow a cute pair of horns that afternoon, but there is nothing like a good dose of a�?tasty-tattlesa�� to digest onea��s lunch. We were invited to bid adieu to the outgoing VP (South) and GM, ITC Gardenia, the dapper Ranvir Bhandari and his wife, the ethereal Danijela, and welcome the new GM, Zubin Songadwala. The party was a blast, where everybody let their hair down and had a wonderful time. 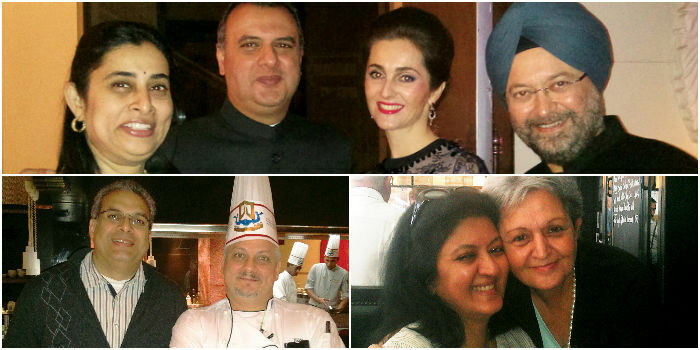 The champagne flowed and guests feasted on the finest repast of Mediterranean, Japanese, Indian and Italian cuisines. I was completely bowled over by delicious morsels of Ferrero Rocher chocolates stuffed with top notch caviar. Ranvir and Danijela are a popular and social couple and their warmth and bonhomie will be surely missed.Danijela and her friends (including yours truly) jokingly call themselves Bangalorea��s Angels (Bangles), and with her move to Chennai, will be hence forth referred to as a�?Changelsa��In life there are no goodbyes, only a�?see you later, alligatora��sa��!